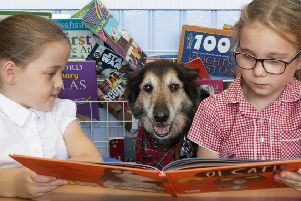 Rescue dog Russell, aged 13, is always met with an adoring audience when he visits Coalsnaughton Primary School, Alloa, Clackmannanshire on a Friday afternoon. The elderly dog is the family pet of school worker Kelsie McAlpine, 25, who came up with the idea of bringing him in to meet the children. Kelsie researched the benefits of children having contact with animals, and said she has seen pupils’ confidence soar since Russell first visited the classroom in February. Only 64 pupils study at the school and they dote on Russell when he comes to visit. The adorable dog wears a tiny uniform, matching the children’s, and a backpack containing a pouch of dog food and his favourite treat - Gravy Bones. Kelsie, who works on the early interventions team, said: “A lot of parents ask about when he is coming in. “Some of the kids aren’t that confident and I have seen in reading groups where there are four children and they have all been really quiet, that you can hear them getting louder as they read. “Dogs do not judge, they just listen. Russell, a collie-Alsatian cross, also takes part in the ‘daily mile’ walk which the children go on each day. His proud owner said: “Somebody in the class gets nominated by the teacher for the responsibility of having his lead. “The children are so empathetic and so loving. When he visits the classrooms, Russell is greeted with applause by the pupils, but often lies down to sleep on the floor. She even stitched him a little sweatshirt after finding an unwanted one in lost property. For children who do not have pets at home, Russell’s visits provide a chance for them to take responsibility for caring for a dog. Headteacher Colleen ClarkBurns is convinced that Russell’s visits teach pupils “compassion and responsibility” - as well as boosting their confidence. She said: “We have a couple of really shy kids, and try to use Russell to build their social skills, so they can get an audience with him. The idea has already caught the attention of other schools in the area.